The 2015 JMRCA 1/12th Electric On-road Championship was held this past weekend in Fukuoka in the two categories of Modified and Stock. 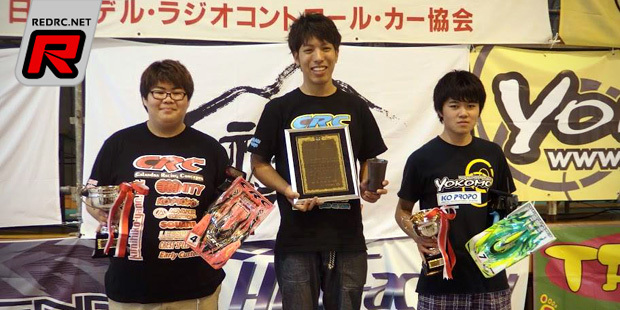 In the Modified class Toto Ebukuro (Yokomo/Yokomo) took the TQ from Yugo Nagashima (CRC/Trinity) and Hideo Kitazawa (Morotech/Trinity). The finals Toto was a bit unlucky as Yugo was able to secure the win in A1 and A2 to take the championship from 4th placed after the qualifiers, Hayato Ishioka (CRC/Trinity). Naoki Akiyama (Yokomo/Yokomo) rounded out the Modified class podium in 3rd.